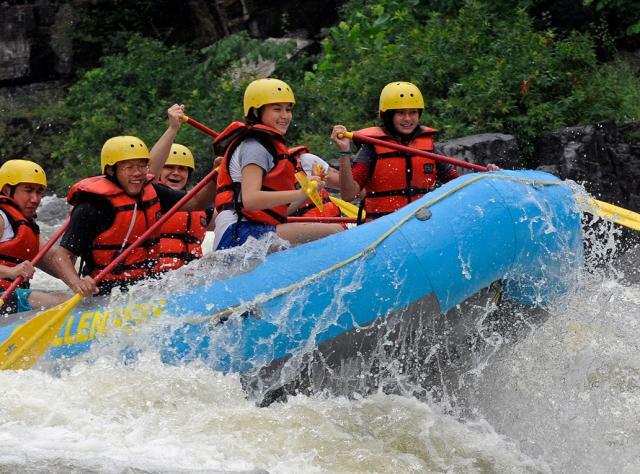 New York State has some of the best whitewater rafting and tubing on the East Coast. Feel the adrenaline rush of New York&apos;s whitewater rapids. Team up with Adirondack River Outfitters for a family-friendly guided tour down the Hudson River Gorge to encounter class V rapids while learning about the natural history and wilderness. Professional river outfitters like Whitewater Challengers, Adventure Calls, and many others strike perfect balances of excitement and control for beginner-level introductions to rafting. For a full weekend of adventure, North Creek Rafting Company offers 1- to 3-day camp and rafting trips on New York&apos;s waterways including the Hudson, Cedar, and Moose rivers. For a relaxing and kid-friendly ride, float down calm waters near Lake George in the beautiful Adirondacks with Adirondack Tubing Adventures. The whole family will enjoy tubing, kayaking, or paddleboarding with Sacandaga Outdoor Center where specialized guides take guests for thrilling raft rides or lazy days on the water. Find your perfect whitewater-rafting, tubing, or jetboating experience!